Recently I came across a magazine article about the discovery of the remains of a 3,500 year old burial in Greece, dating to the time of the Mycenaean civilisation (about 1650-1200 BCE). I knew little about the Mycenaeans, so I read on, looked at a few other online sources, and made some interesting discoveries. Interesting in themselves, but also throwing light on how we might assess the Old Testament. These were the Greeks who Homer, writing 4 centuries after the events, describes in the Iliad as conducting a ten year siege of the city of Troy in about 1250 BCE, eventually winning the war via the deceit of the Wooden Horse. Homer’s classic tale includes characters like Agamemnon, king of Mycenae, Achilles, Hector, Helen (whose face launched a thousand ships of the Greek war fleet), Odysseus, Aeneas and many others. Ancient Greeks and Romans accepted the truth of Homer’s account, but by the 18th century, educated opinion held that the whole story was a fable. No-one knew of the Mycenaean civilisation, whether Troy was a real place nor where it was located. And no-one really knew if Homer was a real person, or whether the stories were just legends passed down by word of mouth until written down about 6 centuries later. 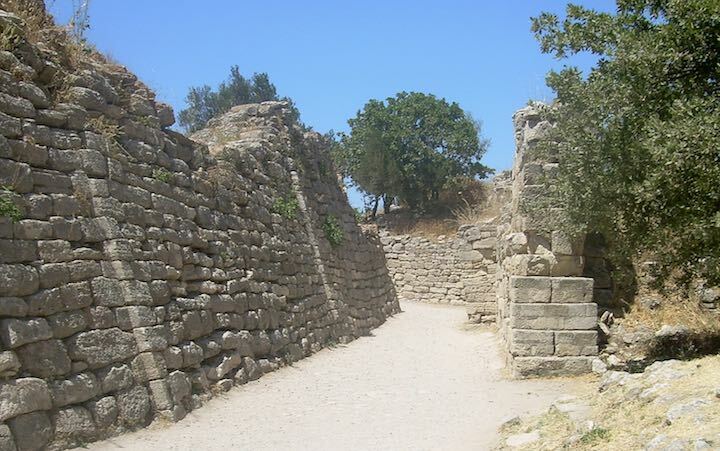 But in the 19th century, ruins of what were claimed to be ancient Troy were found at Hissarlik in western Turkey. Over the years since then, the site of Troy has been further excavated, revealing nine or ten cities built on the site over the period 3000 BCE to around 500 CE, each one destroyed and a new one built on top of the ruins. Over the same period, archaeological investigations in Greece began to unearth evidence of the Mycenaeans. Historians have shown that Homer’s descriptions of locations, especially of Troy itself, are reasonably accurate – and the Troy of the time of the war was definitely well fortified but eventually destroyed. Homer generally knew which cities existed back in the 13th century BCE and the names of people he mentions generally feasibly belong to the period. Perhaps Homer knew something his critics didn’t know after all? But of course knowledge of the geography doesn’t mean the stories are true. And there are occasional errors and anomalies as well. The matter is still not fully resolved, with some arguing for the Trojan War being legendary, others that the war happened as described, with the addition of some obvious legendary material. But it seems that most scholars now think that the fact of the war is historical, but most of Homer’s details are legendary. Similar to the Old Testament? I have just finished a page on Can we believe the Old Testament? based on the findings of archaeologists and historians. As for the Trojan War, conclusions vary from historical scepticism through to belief, with, as far as I can ascertain, the majority of scholars accepting a position somewhere in between. We can, perhaps, summarise the experts’ conclusions for four distinct periods of time. The first 11 chapters of Genesis (Adam & Eve, the tower of Babel, Noah and the great flood, etc) are almost universally accepted as ancient myths or legends with a theological point. This is certainly how similar stories in other ancient near east cultures are understood. We enter a historical world with the stories of the patriarchs (Abraham, Isaac, Jacob and Joseph). We wouldn’t expect much archaeological evidence for what were mostly nomadic herdsmen, but some finds show that Genesis portrays the world of that time quite well. But this is nowhere near enough to verify or refute the ancient stories recorded in Genesis. Most likely these stories were passed down for centuries before finally being written down, by which time their basis in actual events and people had become obscured – not unlike the stories of the Trojan war. The stories of Moses leading 2 million Israelites out of slavery in Egypt and Joshua leading them in conquering the inhabitants of Canaan are much argued over. The minimalists say they are totally legendary because archaeology throws doubt on them all. The maximalists say the archaeology isn’t determinative, and so we should accept the text. As far as I can tell, the majority conclude that there is an historical reality behind the stories, but many of the details and events are legendary. Moses may have existed, but leading 2 million people out of Egypt and across the Sinai is logistically impossible (the column of people would have to be something like 50-100 km long). The Israelites may have destroyed a few cities, but the archaeological evidence doesn’t support the conquest account. Again, the situation isn’t dissimilar to how scholars understand the Trojan war accounts. We are on much better historical ground from about the time of David (about 1000 BCE) onwards. There is plenty of archaeological evidence that supports the Biblical stories, from the remains of “cities” unearthed by archaeologists, to inscriptions on walls, memorials and tablets left by surrounding nations. But of course much remains uncertain. We wouldn’t expect much archaeological evidence for an itinerant teacher like Jesus or a minority religious group like the early church, but what we have tends to support the picture presented by the gospels. Christian apologetics tends to present the view that archaeology supports the Bible, but this is only half true. The Biblical stories from the first millennium BCE are fairly well supported, and the New Testament has some support from archaeology. But the exodus and conquest are not well supported, with some evidence against the conquest account in Joshua – but the apologists generally don’t mention this. The minimalists, on the other hand, completely mistrust the accounts we have, not dissimilar to the Troy sceptics, which seems to ignore the fact that legends and myths can often have historical realities behind them. A different view of the Old Testament? The conservative view of the Bible, held by many christians and rejected and criticised by many unbelievers, assumes that God more or less wrote the Bible with the purpose of giving us a once-for-all revelation of what we should believe and how we should live. But I don’t think we need to make this assumption, but can allow known history and the nature of the Bible to guide our understanding. The christian claim would then be that God has been revealing himself gradually over millennia. At the start of the Old Testament, he used a modified form of existing myths and legends to teach that there was a single creator God who was interested in the human race, not a bunch of squabbling gods who mostly treat humans with disdain, as in most polytheistic beliefs at the time. Gradually, he revealed more and more. Many of the recorded accounts of his revelation were still legendary, but gradually, as languages and the use of writing developed, the stories were recorded soon after the event and became more historical. Eventually, history reigned supreme, and into that setting came Jesus. If you take the Bible as a whole, you see a process in which something which, in its earliest levels (those aren’t necessarily the ones that come first in the Book as now arranged) was hardly moral at all, and was in some ways not unlike the Pagan religions, is gradually purged and enlightened till it becomes the religion of the great prophets and Our Lord Himself. That whole process is the greatest revelation of God’s true nature. At first hardly anything comes through but mere power. Then (v. important) the truth that He is One and there is no other God. Then justice, then mercy, love, wisdom. I think something like this is the truth, as it makes most sense of all the evidence. And if it is so, then both believers and unbeliers are relieved of a burden. Christians are relieved of the burden of explaining and defending the Old Testament based on an incorrect view of what it is, and can get on with following Jesus in the way they live, and defending the New Testament (which is much easier). Non-believers can be relieved of the burden of rejecting a view of the Old Testament that cannot stand on the evidence, and instead draw their conclusions based on what historians tell us about those times and those stories, and focus on the New Testament where the christian claims are based. Photo: portion of the walls of ancient Troy, by CherryX per Wikimedia Commons, CC BY-SA 3.0, Link.